FLEXIS chargers are designed for industrial use, mainly for charging of traction deep-cycle batteries (Laed-acid, GEL, LiFePo4,...) for electric vehicles. Chargers are intended for charging of batteries with Unom 12V-96V and current from 25-225A. (Chargers of other power on request). 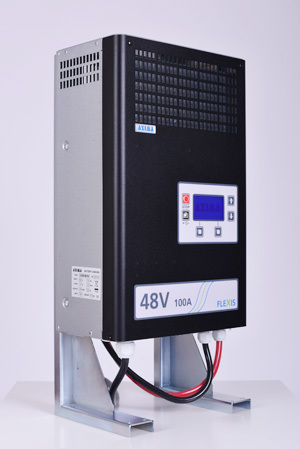 Chargers are modular construction, consist of control unit and power module(s) (input 1ph 230VAC or 3ph 400VAC). Important operating data are displayed on display during the charging. Chargers are fully programable, parameters of single charging cycles are saved in charging archive. FLEXIS is fully programmable, high-frequency charger of traction batteries. Optimised charging technology prolongs working life of battery, accelerates charging and saves energy. FLEXIS charger meets hard requirements of three-shift service in industrial areas. AXInet is a system that optimizes the operation of charging stations using chargers from the FLEXIS series. The system connects individual chargers into groups according to their batteries and evaluates their condition. 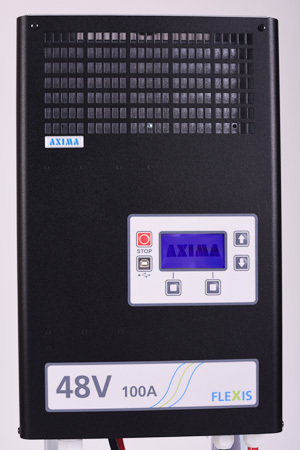 The AXInet system increases usability of batteries and chargers, thus reducing operating costs to the minimum. 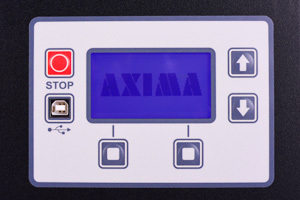 The AXInet data network system can connect up to 255 FLEXIS chargers and thereby acquire an overview of the condition and utilization of the operation.